This MoU embodies the wish of the two players to develop close collaboration in their R&D activities in the fields of sustainable development and the environment, tomorrow’s mobility and intelligent urban solutions. It is also a first step in SystemX’s future ambition to locate in Singapore in 2018. 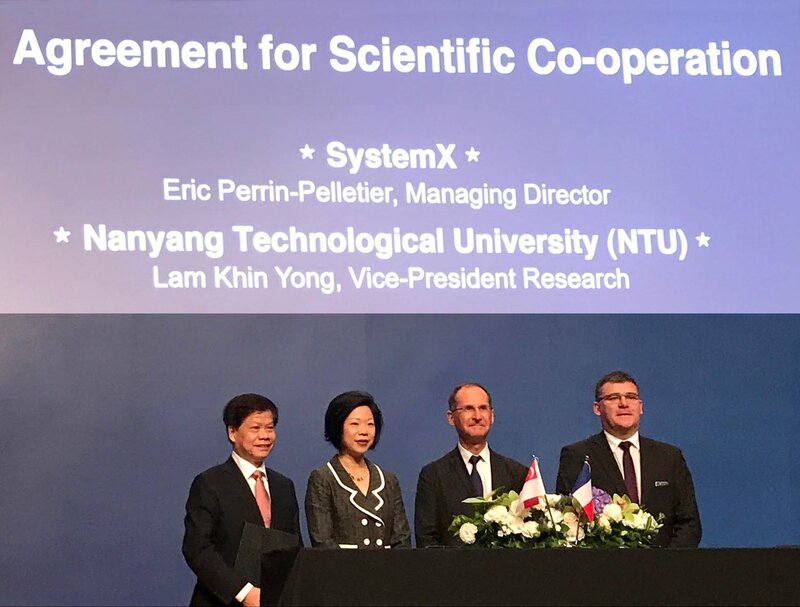 SystemX, the only IRT in the Ile-de-France region dedicated to digital engineering of tomorrow’s systems, has announced the signature of a MoU (Memorandum of Understanding) with NTU. This MoU was ratified by Eric Perrin-Pelletier, CEO of SystemX, and Professor LAM Khin Yong, Chief of Staff and Vice President (Research) at NTU, on the occasion of the first edition of the Singapore-France Innovation Forum, organized by the French Embassy and the A*STAR Agency on Monday 27 March 2017, in the presence of the President of the French Republic. To promote new exchanges and encourage new collaborative projects between the appropriate parties in the field of innovation in both countries, the President of the French Republic François Hollande and the Prime Minister of the Republic of Singapore, S.E. Lee Hsien Loong, declared 2018 the “Franco-Singaporean Innovation Year”. For almost a year, SystemX and Nanyang Technological University have been working on this collaboration project with the shared wish to make progress in their respective research in the fields of sustainable development and the environment, tomorrow’s mobility and intelligent urban solutions. This collaboration also contributes to SystemX’s wish to open a partnered Research and Innovation Center in Singapore, SystemX@Singapour, on digital engineering of tomorrow’s systems, in conformity with its 2020 strategic plan.